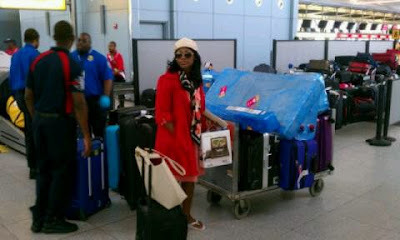 The actress returned alone to Nigeria two days ago.Waiting for Wow! magazine's next edition so we can see wedding pictures. Welcome home, Ms Jombo. shuo….d guy lost abi he dey forbid 9ja? I just hope she is happy oh…!!! linda you are very funny. why do you address her as "Ms" instead of "Mrs"? Well, personally dnt like how she did her wedding quite secretly and the rest things dat follow. anyway, wish her the best in marriage world. Linda you dey mad o. wetin come be miss jumbo now? eh? You are welcome back Home Uche.You are now my Club Member Black and White you are toooooooo much my Girl.I wish Linda same tooooooo. Ms. Jombo? Don't you mean Mrs. whatever-her-husband's-last-name-is? Amebo Linda, she is no longer Ms. Jombo. Don't tell me you are used to the long wait...."Ogechukwu kakwa Mna" Wishing her the Best!!! Why ms jumbo? Why not mrs whatever? Ogaaaa?.Wey broda Rodrigues now after just two weeks. Ok o...... "In Wemimo Films voice Shotitan ni yen For better for worse shotitan niyen!" Ms. Jombo ke? Isn't she married? Na wa for you peeps, when Beyonce married Jayz, did we start referring to her as Mrs Carter. Only Naija attach so much importance to the "MRS" title. And For the record, I am married before you get your claws out. Uche Jombo welcome back Home.I beg show Goldie how to get one now,since no one Favour her for Africa.May be America,Asia,Europe or Australia go favour her ,because the five Continents nor feet be thesame,Uche I beg on her behalf bokonu thanks . 'Ms' can be used to refer to a woman irrespective of her marital status. You have to time to read this blog and post a comment, you should also have the time to do some research on what you comment about. Linda is right to refer her as MS. Jumbo cos she hasnt officially confirmed the wedding and how is Linda supposed to know the name of her husband? Until she officially changes her name, she remains Ms. Jumbo. Buy Why? Why? Why did she have to come 'ALONE' without the hubby? :( or he missed the flight? :s.
NYC-1 says: Linda is right, you bone-heads. "Ms" could be use for married or unmarried women. Uche Jumbo will have nothing to write home about of the wedding. I have said it b4 and will say it again, these people celebrate wedding with only 4 or 5 people present. Those of you waiting for pictures need to travel out of the country for exposure - this will help you in knowing other people's culture. Local champions. I have someone for Goldie, Derenle. Hahahaha @ anon 1:19 no be small match making between goldie & derenle both are drama people. She did puerto rican wedin nt 9ja wedin,we dnt c ha as marid 4now ! So she is stil Ms abeg! N whr d heck is d husband sef! Its not by choice. So she has 2 be redy 2 be addressed as MRS. So itS her fault that she was used and dumped!!!! Dr is nothin wrong in Linda referin 2 her as Ms Jumbo. She has not publicly/officially changed her name here in Naija, or made her marriage known. Secondly, it's not a MUST dat her husband returns 2 Naija wit her. She is d one whose supposed 2 b in her husbands country and not d other way round. Goldie weds terry g.. Denrenle as bestman,charlyboy as chairman... Na die! l hope this so called marriage is not a Hollow Ritual to hoodwink people.How can a lady who just got married not quite long leave her husband & come back empty handed.Naija l hail thee oo.